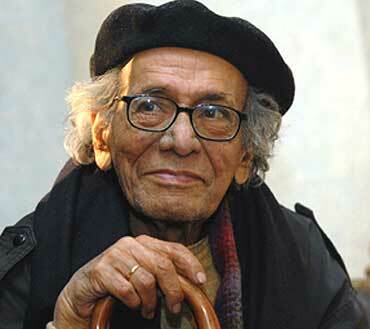 During the last few days I have been remembering Habib Tanvir over the years, ever since we first met in 1954. It's like leafing through an old family album of faded photographs. I knew Habib through his interaction with three people in my family who at various times were important in his life. The first was my eccentric uncle Zulfiqar Bokhari who was the director of the Bombay station of All India Radio (AIR). In 1945 Habib left Aligarh without completing his Masters degree to join the Bombay film industry as an actor. Zulfiqar mamu asked him to work for AIR as a producer and actor. I don’t know whether he learnt anything about radio broadcasting while on the job, but it certainly whetted his appetite for becoming an actor. And like many who were influenced by Zulfiqar mamu, Habib adopted his style of accentuated dialogue delivery, something he was to retain throughout his life. For a while Habib copied mamu’s "afro" hairstyle as well. The radio stint didn’t last too long because Zulfiqar mamu opted for Pakistan in 1947 and went back to his hometown, Lahore. Habib then turned to doing odd jobs, writing for films and advertisement shorts, editing various journals and "struggling" to become an actor. Like many of his generation of students of AMU, Habib was influenced by leftist politics and this marked his political stance from then onwards, though he threw away his party card very soon after he acquired it. Just before Habib arrived in Bombay, the Indian People’s Theatre Association (IPTA) had just been founded. He immediately began to take part in its activities. They rehearsed in a hall near Opera House and Habib acted in plays directed by Balraj Sahni and Dina Pathak. I remember him telling us how they used to stage street plays by pretending to be a pickpocket and a policeman quarrelling. The crowd which collected had no idea that this was just a play and by the time they found out and the real police arrived, the actors melted away. When the Communist Party of India was banned many IPTA members were jailed or went underground. From 1948-50, Habib was left with the responsibility of running the organization. After which the doctrinaire Ranadive line made it impossible to do anything worthwhile in theatre and the group became almost defunct. In Bombay, Habib edited the English periodical of the Bombay Youth League, which he sold on the pavements of Bombay as well. One of his earliest assistants in this venture was the second person in my trio, my husband M.S. Sathyu. Sathyu ran away without completing his studies in Bangalore and landed in Bombay in 1951. The only two people he knew in Bombay were Khwaja Ahmed Abbas and Habib Tanvir, who also edited a film paper that Sathyu happened to come across in Bangalore. Sathyu sought out Habib and they became friends and shared a flat near Churchgate station. As IPTA had fallen apart and Habib’s attempts to become a filmstar weren’t leading anywhere he decided to leave Bombay. In 1953 Habib and Sathyu left to teach drama and art respectively in a Montessori school in Delhi run by Mrs. Elizabeth Gauba. Indira Gandhi was a close friend and her two sons attended this school while Habib was there. Sathyu and Habib lived on the premises and became part of Mrs. Gauba’s family. She had a large circle of friends, including my mother Begum Qudsia Zaidi and Habib managed to enthuse her about forming a professional theatre group. My mother had grown up in Lahore and her brother-in-law Ahmed Shah Bokhari (Zulfiqar mamu’s brother) was one of the first people along with Imtiaz Ali Taj to stage modern plays for Government College, Lahore, where he taught English literature. She and Habib decided that they would start out by presenting adaptations of European classics as well as Sanskrit dramas which, apart from Shakuntala, were almost unknown in Hindi-Urdu theatre. She set about translating a number of plays herself. Meanwhile some friends in Jamia asked Habib to stage plays with a new group they had formed. In 1954 he wrote Agra Bazar which was staged by him with a group of villagers and amateur actors from Jamia. This was followed by a dramatization of Premchand’s Shatranj ke Mohre. Sathyu designed these plays and did the lighting as well, before going back to Bombay to work with Chetan Anand. It was in the winter of 1954 that I met Habib who used to come and visit my parents. I was in the 9th standard in boarding school in Mussoorie, and was in Delhi for my winter holidays. And I developed a terrible crush on Habib about which he was faintly amused. I went back to school in spring and later in the year Habib left for England to study acting in the Royal Academy of Dramatic Arts and later direction in the Bristol Old Vic Theatre School. After many months of a study tour which took him all over Europe, he returned to India in 1958. Of this time, eight months were spent studying the plays of the Berliner Ensemble, the theatre founded by Bertolt Brecht. The influence of Brecht made him discard all that he had learnt in England. He took to heart Brecht’s dictum that theatre needs to be fun, like the music-hall or football. Some of the Brechtian concepts had already been tried out by him in his production of Agra Bazar and Shatranj ke Mohre which were produced by the Okhla Theatre Group. But the example of the Berliner Ensemble inspired him to use song and dance as part of the theatrical style. Use of folk idiom had already become popular in Marathi and Gujarati plays staged by IPTA, but Hindi-Urdu theatre had no such experiments until Habib came along. By this time my mother had set up the Hindustani Theatre, and two plays Shakuntala and Khalid ki Khala had been staged, both directed by Monica Misra. Habib now decided to stage a musical version of Shudrak’s Mrichchakatika as Mitti ki Gaadi (translated by my mother). While the script was being polished he went home to Raipur to visit his family. There he met a group of "nacha" style folk actors of Chhattisgarh and was so impressed with them that he brought them back to act in Mitti ki Gaadi along with a few Hindustani Theatre full-timers. For this production Sathyu had called the poet Niaz Haider from Bombay to write the lyrics. Habib had to bully and cajole Niaz Baba to produce anything in a time-bound manner. But the final script was quite marvellous. The play was a complete revolution for Delhi theatre goers. It was panned by the critics as an insult to a Sanskrit classic, but the audiences seemed to enjoy it. Later, the most outspoken critic of the production, Suresh Awasthi, became a devotee of Habib’s new style of theatre. My mother had a terrible argument with Habib because of his use of folk actors. In a huff he left to form his own group. Monica Misra, who originally resented being upstaged by Habib, had by then fallen in love with him and she also left Hindustani Theatre along with Habib. By then I had left for England and Germany to study stage and costume design. When I returned in 1961 my mother had died of a massive heart attack and the Hindustani Theatre Repertory Company had been disbanded. Habib and Monica married and formed their own group, the Naya Theatre. The Naya Theatre included a large number of nacha actors from Chhattisgarh plus some enthusiastic urban acolytes of Habib. Another version of Agra Bazar was produced by him using this combination of urban and folk actors. For many years indulgent officials allowed Habib and Monica space in Delhi to house their troupe in a government colony and they put up many memorable productions. While Habib and Monika were working out their ideas using folk elements and the nacha actors, Sathyu and I tried to keep the Hindustani Theatre going as an amateur group. Sathyu staged my mother’s translations of Brecht’s Chalk Circle and I decided to direct Mudrarakshas. Niaz Baba added the recitative verses and songs for these plays. But halfway through Mudrarakshas, he suddenly announced one day that he just had to go to Brindaban and we didn’t see him for four months. Habib then offered to complete the verses for the play. Many years later he used the same script for his own production of the Mudrarakshas. Habib continued his productions for Naya Theatre but we had to wind up the Hindustani Theatre and leave for Bombay. Four years later I returned to Delhi in connection with the Ghalib Centenary celebrations in 1969. We commissioned a number of plays and other shows which were performed as part of the Ghalib festival, including a splendid play by Habib. For some reason the play was never repeated by him after that. Habib at first continued with his mix of urban and folk actors but then decided to shift to Bhopal and work only with his "nacha" actors. Then we lost touch until 1974. Charandas Chor was staged by Habib as a short play for a workshop in Jaipur, after which Habib worked with me on a film-script for a film by Shyam Benegal, based on the same story for the Children’s Film Society. Habib later expanded the script into a full-length play, and along with Agra Bazar it is the play most people remember him for. Except for Smita Patil who played the princess all the other actors were "nacha" performers from Habib’s "Naya Theatre". Our cameraman Govind Nihalani would get exasperated with them because the dialogues and acting for each take was improvised and so did not match what had been shot earlier. The film was shot in the style of the old Keystone Cops and Chaplin films and is still quite amusing. It was after Charandas Chor that Habib’s signature style was recognized all over the country. And, as someone has said, he became a legend in his own lifetime. One kept getting news of him from various people and read about his victimization by the Hindutva forces; his being forced out of the Repertory Company in Bhopal and the attempt to ban his staging of Ponga Pandit. One story he used to repeat with glee was his reply to the BJP minister Sikandar Bakht who advocated the cause of "Urdu theatre" during a seminar. Habib told him there was no such thing as a separate Hindi and Urdu theatre. They were the same. In any case, the minister himself knew nothing about theatre, what he did know was how to destroy old mosques and Habib was quite willing to give him a list of further mosques he could destroy. After Monica passed away in 2003 Habib could not continue with the same vigour. But he still ate and breathed theatre till the last day of his life. The 2004 festival of many of his plays, staged at Prithvi Theatre, Mumbai, was like a swan song. We met a few times during this festival and he reminisced about Monika and the old days. Then a few months ago he came to Bombay for readings from his forthcoming memoirs. Mahmood Farooqui read a few excerpts as Habib was liable to get breathless, and Habib answered a few questions. His daughter Nagin tells us that he had just got to the Monica part of the memoirs before he went to the hospital, never to come back.